Do you recognise this man? 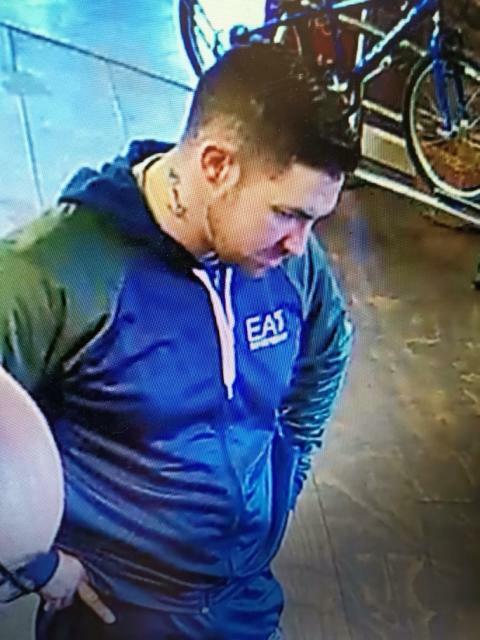 We’d like to speak to him after a bike was stolen from a shop in Brockenhurst. The incident happened between 2.05pm and 3pm on Monday, 26 November. A man entered Cycle Experience, Station Approach, and began talking to staff about buying a bike. The man then left but returned to an area that does not have public access, and then took a Kona Fire Mount mountain bike from that area, which belonged to a member of staff. The man officers want to speak to is described as: white, aged between 20 and 30, 5ft 10ins of stocky build and with short dark hair. He was wearing a distinctive green and blue EA7, Emporio Armani, tracksuit. He also has the name ‘Becky’ tattooed on the side of his neck.